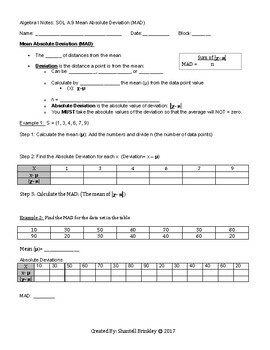 This 1 page cloze note sheet will guide students through understanding what the Mean Absolute Value is. 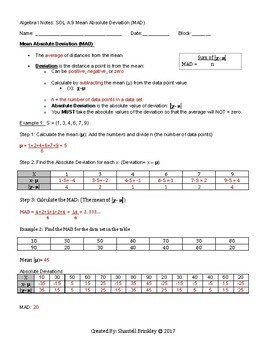 Students will also have the opportunity to calculate the Mean Absolute Deviation for 2 sets of data points by hand. An answer key is also provided. You are purchasing access for 1 teacher as a classroom set. The document is not to me shared with others or posted on any online venue at any time. For multiple teachers in a school please purchase the number of licenses required for a discounted price. (1 license per teacher). For district use, please contact the seller.